1. For each person thinly slice (about 1/8 inch) 2 red potatoes and place in pie pan or on a big piece of foil. Top each pan of potatoes with a meat patty and sprinkle the potatoes generously with seasoned salt or garlic salt and pepper, then drizzle with a olive oil, especially over the potatoes. 4. 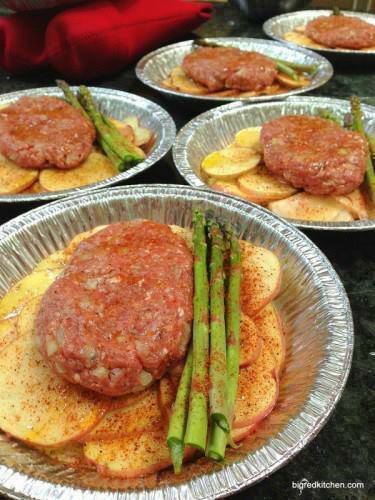 Cover with foil and bake at 400 degrees for 35-45 minutes or until potatoes are fork tender. 5. Serve with BBQ Sauce, Ketchup, or HP Sauce.